Beyond a shadow of a doubt 2016 has been the year of the ransomware. So it comes as no surprise that new ransomware families are popping up on weekly basis. Emsisoft has been on the frontline battling ransomware for years now, providing users with valuable tools allowing them to recover their files after ransomware attacks. As a result Emsisoft researchers often find themselves at the receiving end of hate from ransomware authors. Late last year, we took a look at Radamant, whose authors included some rather unkind messages after our research team broke their amateurish ransomware. Today, we want to take a look at a new ransomware family Apocalypse, that reared its ugly head about 2 months ago, that recently started spewing insults towards our team as well. The Apocalypse ransomware was first seen on the 9th May. The main attack vector is weak passwords on insecurely configured Windows servers running the remote desktop service. This allows an attacker to use brute force to gain access and means they can easily interact with the system as if they had access in person. Abusing remote desktop has become increasingly common over the last few months, especially for running ransomware like Apocalypse. The earliest variants install themselves to %appdata%windowsupdate.exe and create a run key called windows update to both HKEY_CURRENT_USER and HKEY_LOCAL_MACHINE. This variant uses the .encrypted extension. A ransom note is created for every file in the form of *filename*.How_To_Decrypt.txt. The [email protected]/[email protected]/[email protected]/[email protected] email addresses are used in the ransom note. To give you a better idea on how Apocalypse operates, we want to take a closer look at one of the newest variants with the hash AC70F2517698CA81BF161645413F168C. The ransomware first checks the default system language and if it is set to Russian, Ukrainian or Belarusian then the ransomware will quit and not encrypt the system. Once installation is complete, it then runs the newly created firefox.exe, which then deletes the file. The firefox.exe file does two different tasks at the same time: First, it periodically checks whether certain Windows processes are running and then kills them. Second, it starts the encryption routine where it gets a list of all removable, fixed or remote network drives; the latter however is never encrypted due to a bug in the ransomware. The ransomware then scans all folders and any files found will be encrypted. Files located in the Windows folder are skipped as well. All your data – documents, photos, videos, backups – everything is encrypted. Decrypted FILE as proof that we actually have the decrypter software. 1. The FASTER you’ll CONTACT US – the FASTER you will RECOVER your files. 2. We will ignore your e-mails without IP server number in Subject. 3. If you haven’t received reply from us in 24 hours – try to contact us via public e-mail services such as Yahoo or so. As before, we see messages like this as validation of our work and consider it a backwards compliment. How can I decrypt my files encrypted by this ransomware? 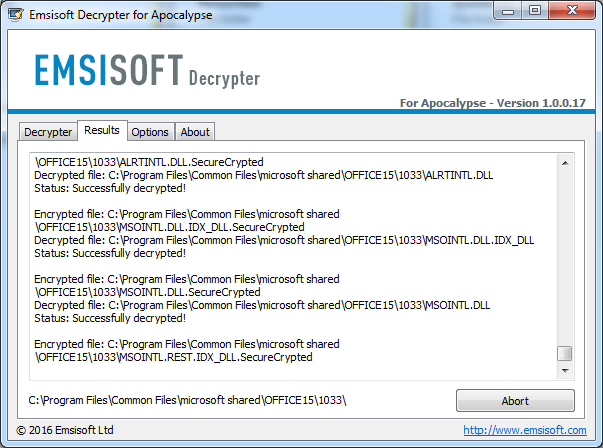 As for many other ransomware families, Emsisoft provides a free decrypter to all Apocalypse victims that allows them to decrypt their files for free. The decrypter is available for download at our Emsisoft Decrypter portal here. Due to the nature of the attack protection software is rather ineffective. If the attacker manages to get access to the system via remote control, they can simply disable any protection software installed or add the malware to the protection software’s exclusion list. It therefore is imperative to prevent the attacker from gaining access to the system to begin with. The most important line of defense is a proper password policy that is enforced for all user accounts with remote access to the system. This does apply to rarely used accounts created for testing purposes or by applications as well. Even better would be to disable Remote Desktop or Terminal Services completely if not required or at least to use IP address based restrictions to allow the access to these services from trusted networks only. Malware analyst at Emsisoft. Cryptolocker hitting so many people in 2013 was what really piqued my interested in malware, and especially ransomware. Emsisoft researchers have released a free decrypter for the CryptoPokemon ransomware. Download it here. Our research team has uncovered a new ransomware campaign that seems to target Comcast Business users. This major update features an all-new Emsisoft Anti-Malware interface designed for improved usability, efficiency, and optimized for Windows machines.